Classic Boat Shop in Bernard, ME recently received the coveted SHARP (Safety and Health Achievement Recognition Program) award from the Occupational Safety and Health Administration OSHA. The award was created as an incentive for small businesses to meet and exceed federal and state safety workplace standards. Founded in 1996, Classic Boat Shop is a full service boatyard, brokerage and boat building facility on Mount Desert Island. They are the exclusive builder of the Pisces 21 Daysailer (pictured), a C.W. Paine-design inspired by the Herreshoff FISH class. The shop has produced more than 40 Pisces 21s, and the semi-custom 21-foot sloop is available with either cold-molded wood epoxy or fiberglass construction. 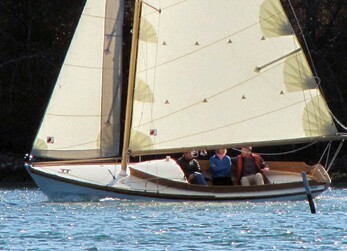 Visit classicboatshop.com/usa for more information.